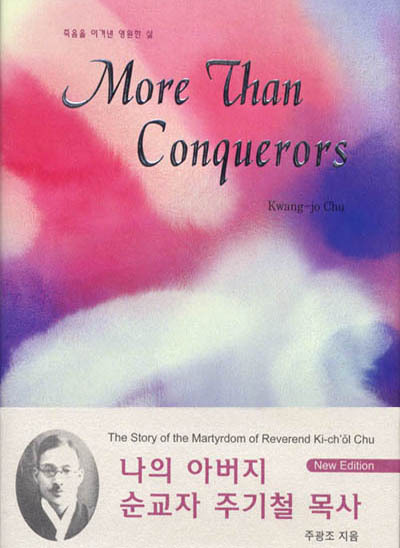 When More Than Conquerors was first released in October 2004, it made it on Kyobo Bookstore's and Youngpoong Bookstore's bestseller list of books in the category of religion. And within 18 months since its first release, the book reached its 7th printing. This biography focuses on Reverend Ki-chol Chu's bold walk of faith and courageous martyrdom during the most devastating years in Korean church history. Written by Reverend Chu's youngest son Elder Kwang-jo Chu from firsthand personal experiences, this book illuminates an inspirational yet historically accurate account of the martyr's walk of faith. In 1963, the Government of the Republic of Korea presented the "Order of Merit for National Foundation, Independent Medal" (medal awarded to individuals who contributed to the founding of the Republic of Korea) to the Reverend in posthumous recognition of his lifetime display of faith in action. In 2006, sixty-seven years since he was dismissed from his position by the decision of the Pyeongyang Presbytery, that very same Presbytery reinstated Reverend Chu's position as a symbol of true Christian faith. The year 2007 marks the 100th anniversary since the 1907 Pyeongyang Revival. KWANG-JO CHU is the youngest of the late Reverend Ki-chol Chu's four sons. He was born in Masan in 1932. Having witnessed the martyrdom of his father, he struggled with a severe speech impediment. After Liberation in 1945, he was healed and was even able to attend school. Following his graduation from Seoul High School, he entered the military during the Korean War, later discharged after five years of service. He went on to study at the College of Business and Economics at Yonsei University. After graduation he worked for Keukdong Oil, for Seil Oil, and later for Seyang Industrial, retiring as vice chairman. After his retirement from Seyang, he took on a volunteer position as president of operations at the Far East Broadcasting Company and also served as vice president and advisor to the Board of Directors. Although Mr. Chu stepped down in 2004 after 12 years of voluntary broadcasting ministry with the Far East Broadcasting Company, he still serves as part-time advisor. Through his service as an elder at the Youngnak Presbyterian Church, he has dedicated his whole life to witnessing his father's martyrdom and thus proclaiming the martyr's faith. The Ki-chol Chu Memorial Foundation holds a memorial service and seminar annually. He and his wife have two sons, three grandsons, and two granddaughters. They live in Seoul, Korea. This biography which focuses on the last years of Reverend Ki-chol Chu's life ending in his martyrdom has been written by his youngest son Kwang-jo Chu. Reverend Chu, whose name is synonymous with the expression "martyr of Korea," is a representative figure in Korean church history and his life and martyrdom have helped shape the faith of modern day Korean Christians. Readers will be inspired by Reverend Chu's display of courage and the strong faith and will be deeply moved to wonder, "What can I offer to the Lord?"